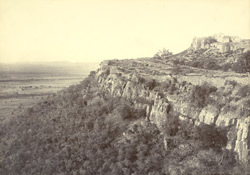 Photograph from the 'Curzon Collection: Album of views of Udaipur and Chittaurgarh', of a part of the fortress at Chittore, taken in c.1905 by an unknown photographer. The impressive hill-fort of Chittorgarh is situted on a narrow rocky ridge that rises abruptly about 150 metres above the plain. Its strategic position had made it the capital of the Rajput power in Western India until it was sacked twice and abandoned as a capital in the 16th century.